Background and objectives The long-term effect of immunosuppressive therapy (IS) on kidney survival in idiopathic membranous nephropathy (MGN) is debated. The introduction of renin angiotensin blockade, rigorous BP control, and the increasing age at presentation of patients with MGN adds further uncertainty. Given these important changes, we sought to determine whether implementation of IS has altered outcome. Design, setting, participants, & methods We prospectively evaluated 280 incident MGN patients from three distinct 10-year periods starting from 1975. Results We found expected changes in treatment regimens but also variations in age, renal function, severity of proteinuria, and BP at presentation over this time. Outcomes did not differ over time if these significant variations in clinical characteristics were not accounted for across the eras. The effect of IS in the 57 patients treated with currently recommended regimens was assessed using propensity adjustment to address selection bias and the effect of newer, conservative therapies. A propensity score estimating the probability of receiving IS permitted the pairing of 39 treated patients with controls with similar high risk of progression of clinical features. Using this approach, IS was associated not only with remissions in proteinuria but also with substantially improved renal survival. Conclusions The study confirms that patient presenting characteristics and management regimens have changed significantly over time and the natural history of MGN has been altered. A study of propensity-matched patients confirms that current recommendations for IS have improved outcomes in MGN patients at high risk of progression. Membranous nephropathy (MGN) is the most common cause of nephrotic syndrome in adults and it remains an important cause of renal failure (1–3). The design and conduct of therapeutic studies for treatment of MGN remains a challenge because of its relatively slow evolution and highly variable natural history. Long-term follow-up publications of randomized controlled trials (RCTs) on cytotoxic therapy have demonstrated a reduction of ESRD in some (4,5) but not all studies (6). The effect of calcineurin inhibitors on remission of proteinuria is clear, but their effect on renal survival is uncertain (7). A systematic review based on 18 randomized controlled studies has suggested that no class of drugs has convincingly changed the combined endpoint of ESRD or death (8). The benefits of immunosuppressive therapy remain an area of active debate (9–11). Adding further uncertainty has been the introduction of “kidney protective therapies” that act through inhibition of the renin-angiotensin system (RAS) (12), the refinement of therapeutic goals for BP, and an older age of presentation of MGN that produces an inherently different population base compared with patients enrolled in earlier RCTs (13). These elements are likely to influence the natural history and subsequent assessment of the benefit of immunosuppressive treatment (12,14). Given the changes in recommended immunosuppressive therapy over this time frame but tempered by their recognized potential for toxicity, the assessment of their effect on long-term outcome remains a crucial element in MGN management. Implementation studies are rarely performed in clinical research but are the final demonstration that a proposed treatment has changed outcome in the everyday setting (15). We hypothesized that irrespective of substantial changes in baseline characteristics and concurrent advances in conservative therapies, the implementation of current immunosuppressive regimens in MGN patients at high risk of progression during the past decades has led to a more favorable outcome. Using our prospectively collected database of MGN, we performed a propensity score analysis that allows adjustment for multiple variables at baseline to determine the validity of this hypothesis. All patients with idiopathic MGN enrolled in the Toronto Glomerulonephritis Registry were considered for this study. This database began in 1974 and includes all biopsy-proven cases of GN from the Toronto area. Patient information at onset of the disease is compiled using a standard form, and registrars perform a periodic prospective assessment of the patient's clinical status, medication, and laboratory results (16). This study included only patients older than 16 years at presentation with at least 12 months of follow-up and no known secondary cause for their renal disease. Demographics recorded include age and body mass index at onset, gender, and race. Parameters prospectively collected include initial and follow-up information on systolic and diastolic BP, weight, serum creatinine, and 24-hour urine protein and creatinine measurements. Also recorded were exposure to immunosuppressive agents and antihypertensive medications, including the angiotensin-converting enzyme inhibitor (ACEI) and angiotensin receptor blocker (ARB) classes of drugs. Three 10-year periods starting in 1975, 1985, and 1995 were compared (Figure 1). To avoid overlap, a patient's follow-up was truncated at the end of an era if it extended beyond that period. We excluded new patients within 3 years of the end of each of the eras to permit sufficient follow-up in every case. Patient selection in the three eras of interest. Because this was a prospective observational cohort study, enrollment in the registry was independent of any and all therapeutic decisions. The patient's specific nephrologist determined these. Given the multiple treatment regimens that have been utilized over this time frame, we categorized all patients into one of three groups: no immunosuppressive therapy, immunosuppressive treatment not recommended by current guidelines (corticosteroid monotherapy or azathioprine), and immunosuppressive regimens that were deemed to be adequate on the basis of current international consensus guidelines (cyclophosphamide, chlorambucil, or cyclosporine with or without steroids) (17,18). The effectiveness of therapy was evaluated by analyzing all patients in each group using an intent-to-treat approach. Creatinine clearance (CrCl) values were calculated using the Cockcroft–Gault method (19). CrCl was adjusted for body surface area using the Dubois and Dubois equation (20). Renal failure was defined as a CrCl ≤ 15 ml/min per 1.73 m2, the start of dialysis, or a renal transplantation. Mean arterial pressure (MAP) was defined as the diastolic pressure plus one-third of the pulse pressure. For each patient, average MAP was determined for each 6-month period of follow-up. Time-averaged MAP represents the average of every period's mean. The proportion of subjects with MGN without a partial or complete remission in proteinuria was also determined (21). This group was used as a surrogate for a poor prognosis as previously established. Exposure to ACEIs or ARBs was considered as a dichotomous variable, and the duration of treatment was expressed as a percent of the total follow-up. Normally distributed variables are expressed as mean ± SD and compared using a t test or one-way ANOVA. Nonparametric variables are expressed as median with interquartile range (IQR) and compared using the Mann–Whitney or Kruskal–Wallis tests. Categorical variables are expressed in percentage and compared using a χ2 test. The rate of renal function decline (slope) was determined by fitting a straight line through the calculated CrCl using the principle of least squares. Given the very significant differences in presenting characteristics, initial laboratory values, and conservative management strategies over of this time, we performed a propensity score analysis to determine the value of immunosuppressive therapy. Using logistic regression modeling, we derived predicted probabilities (propensity scores) for receiving immunosuppression (22,23). Given the number of patients treated, only five variables could be included in the model. We chose the most clinically relevant ones and those that differed most between eras. We then matched all treated patients to a control with the closest propensity score up to a ±0.05 difference, a conservative value (24). We assessed the discrimination of our model using the c-statistic and receiver operating characteristic curve. Univariate comparisons of renal survival were done by Kaplan–Meier curves, log-rank test, and Cox proportional hazard regression. Because immunosuppressive therapy was a time-dependent variable (i.e., not necessarily prescribed at onset but given during follow-up), the Cox proportional hazard model was repeated using a time-dependent expression to confirm the kidney survival benefit accrued from the time immunosuppression was initiated. All P values were two-tailed, and values < 0.05 were considered statistically significant. Analyses were carried out using SPSS software (version 16.0, SPSS, Inc., Chicago, IL). Two hundred and eighty patients with biopsy-proven MGN were included. The mean age of the total cohort at presentation was 48 ± 15 years with an initial CrCl of 78 ± 29 ml/min per 1.73 m2, proteinuria of 6.0 g/d (IQR: 3.4 to 10.0 g/d), and BP of 137/84 mmHg followed for 47 months (IQR: 27 to 67 months). Women represented 33% of the total group, and more than 75% were Caucasian. The average rate of renal function decline was −3.9 ± 8.7 ml/min per 1.73 m2 per year, and 24 patients reached ESRD. There were 86 patients enrolled in the first era, 145 in the second, and 49 in the third. Patients clinical and laboratory characteristics differed significantly across each time period (Table 1). Patients from era 1 were younger than patients from eras 2 and 3 and had a lower peak proteinuria. Patients from era 2 presented with a lower CrCl. Those from era 3 had a significantly lower follow-up BP compared with patients during the previous two eras. Therapeutic interventions varied considerably over time (Table 1). Patients in era 3 received a greater number of antihypertensive agents. The utilization of ACEI or ARB therapy increased dramatically from 0% to 27% to 90% from eras 1 to 3, respectively. A total of 57 patients received immunosuppressive treatment in line with current recommendations and, at times, in sequential fashion. Eighteen were treated with cyclosporine for a median time of 11 months (IQR: 4 to 22 months) and 47 were treated with a cytotoxic drug (3 with chlorambucil and 44 with cyclophosphamide [3 of the 44 intravenously]) for a median of 8 months (IQR: 3 to 15 months). A single patient received mycophenolate mofetil after cyclophosphamide. No patients received rituximab or tacrolimus. Patients from era 2 experienced the worst outcomes in terms of proteinuria and kidney function. Thirty-seven percent had no remission in proteinuria, compared with 24% in era 1 and 18% in era 3 (P = 0.02). Their rate of renal function decline also tended to be faster (−5.0 ± 10.3 ml/min per 1.73 m2 per year compared with −2.8 ± 6.7 and −2.6 ± 6.0 ml/min per 1.73 m2 per year in eras 1 and 3, respectively, P = 0.08) and their renal survival was lower (Figure 2). 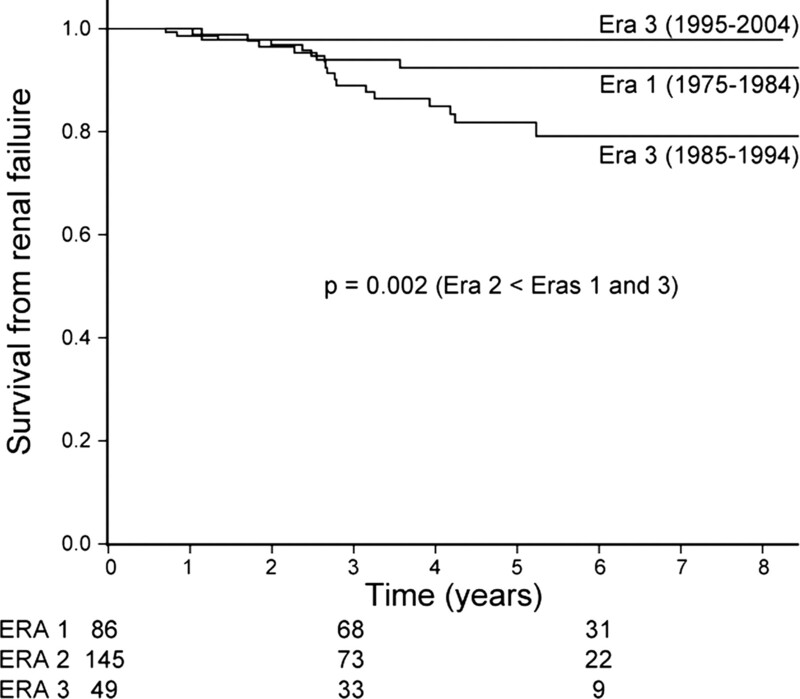 The renal outcomes from era 3 remained similar to those in era 1 (Table 1 and Figure 2, log-rank test, P > 0.1 comparing era 1 to era 3). Renal survival of three separate eras. Marked clinical differences known to affect outcome existed between patients receiving versus those not receiving immunosuppressive therapy (Table 2). Given these differences, we utilized propensity score matching to help balance known risk profiles to determine if the implementation of immunosuppression resulted in a more favorable outcome. To properly pair patients, we derived a propensity score estimating the probability of receiving immunosuppressive therapy using the following variables: peak proteinuria, initial CrCl, age, follow-up BP, and use of RAS blockade. We excluded patients receiving immunosuppression regimens not recommended by current guidelines. The logistic model had a good discrimination with an area under the curve (c-statistic) of 0.82 (95% confidence interval [CI]: 0.76 to 0.88). Thirty-nine of the 57 treated patients could be paired to untreated controls within a propensity score of 0.05. Patient characteristics of both groups are shown in Table 3 and demonstrated adequate balancing of clinical variables at presentation. This subgroup analysis included high-risk patients with a median peak proteinuria of 11.8 g/d (IQR: 9.7 to 16.4 g/d. A similar proportion of patients received RAS blockade (41% versus 39%, P > 0.1). Outcomes favored the treated group, with 79% achieving a remission compared with 44% in controls (P < 0.001). The rate of renal function decline was 40% slower in the treated group, although this did not reach statistically significance (−3.6 ± 6.8 compared with −6.1 ± 11.0 ml/min per 1.73 m2 month, P > 0.1). Most relevant was that renal survival was better in the treated group with a hazard ratio of 0.10 (95% CI 0.01 to 0.80, P = 0.03; figure 3, log-Rank test). Because treatment was rarely begun at the first assessment, we repeated the Cox regression using a time-dependent expression of immunosuppressive therapy to assess whether the survival benefit existed after initiation of treatment. This analysis accounts for the survival time and loss of renal function before therapy to verify the absence of a lead-time bias. 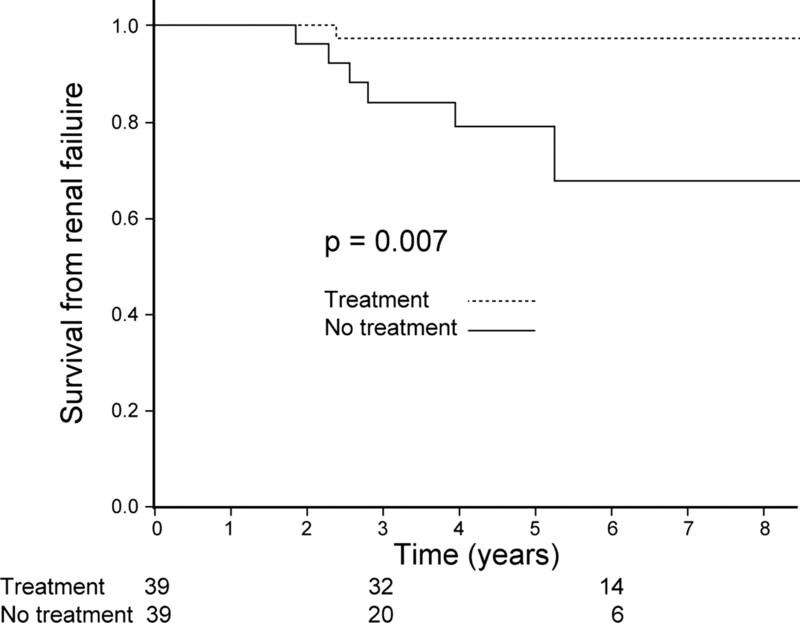 The time-dependent hazard ratio remained unchanged at 0.10 (95% CI 0.01 to 0.85, P = 0.04), indicating the relevance of the immunosuppressive therapy in these high-risk MGN patients. Survival among propensity-matched treated and control patients. The benefits of immunosuppressive therapy in MGN remain a subject of debate. A recent systematic review suggested that no class of drugs has convincingly changed the combined endpoint of ESRD or death (8). Our main objective was to study the outcome of patients followed prospectively in a large registry to determine whether the implementation of immunotherapy according to current guidelines from RCTs has altered the prognosis of patients with MGN. To avoid a survival bias where patients from older eras have a longer time-to-treatment period, we truncated follow-ups after a maximum 10 years to obtain similar observation time between eras. The unadjusted analysis from this longitudinal cohort showed similar outcomes between the first time period (1975 to 1984) and the last period (1995 to 2004). However, we noted in each cohort important variations in presenting characteristics now known to significantly affect long-term outcome (21,25). These variations hamper the capacity to make direct comparisons of treatment regimens within each era and potentially bias the analysis of the effectiveness of immunosuppression. Given these unalterable but important prognostic variables, we repeated the analysis of the data following the creation of a matched propensity score cohort of patients with a similar high risk of progression profile. Applying this analysis showed a dramatic improvement in renal survival, the best recognized, hard endpoint in patients with kidney disease. MGN patients at high risk of progression receiving currently recommended immunosuppressive therapy had a substantially higher survival rate. This finding was independent of BP control and exposure to RAS blockade therapy. The application of evidence that is based on the results of clinical trials is a key aim of modern medical practice. RCTs are considered the “gold” standard for evaluating the efficacy of therapeutic interventions and defining health care policies (26). They generate the most reliable form of scientific evidence as compared with other study designs because they reduce the likelihood of spurious associations more readily seen in observational studies (27). However, they do have limitations. Patients enrolled in RCTs often differ from the overall population with the disease. External validity can be further reduced by failure of the randomization process to account for factors later shown to affect outcome (e.g., BP control and RAS blockade). Also, the costs of performing lengthy studies are often prohibitive, and the rarity of many of these diseases makes adequate enrollment difficult. This limits the study's size and duration, which potentially leads to invalid or erroneous conclusions. In light of these limitations, evidence to support results from RCTs and their implementation using larger and longer observational studies are important and may influence the content of treatment guidelines (28,29). Many of these limitations are particularly relevant to MGN. First, recognizing the slow rate of progression of MGN automatically makes long-term follow-up studies of RCT publication essential in regards to determining the effects on hard outcomes such as ESRD (4). However, maintaining follow-up of patients on a standard regimen that has been shown to be inferior in the very study they were in, as opposed to crossing over to the effective treatment merely for the purpose of demonstrating superior hard outcomes, is unethical and a disservice to the patient (5). Second, previous published RCTs included patients substantially younger than our most recent era cohort (4,5). The average age of patients included in 20 RCTs at randomization was 9 years younger than our era 3 patients (8). The known effect of age on renal survival illustrates the importance of balancing the initial patient characteristics (30). Its variations alone could potentially affect the ability to demonstrate the therapeutic efficacy of these different treatment regimens on definitive long-term outcomes. Third, RCTs studying patients with MGN have spanned several decades that encompass not only the development of new conservative treatment regimens such as RAS blockade therapy but also different standards of conservative management including BP targets (12,31,32). The selection of patients to be included in a study is another important consideration with particular relevance to MGN. We now understand the vastly different risks of progression partially identifiable at the time of presentation of these patients. Those with low-level proteinuria have an excellent outcome regardless of treatment, and their inclusion can influence the observed value of a proposed treatment. Baseline clinical and laboratory variations in our study clearly show that patients in the first era cohort had a lower risk profile (including younger age, a higher percentage of women, lower BP, and lower peak proteinuria) than the more recent eras, making direct comparisons of the natural history and the benefits of immunosuppression difficult if not impossible to assess. The immunosuppressive recommendations for MGN based on RCTs include cyclophosphamide, chlorambucil, and cyclosporine regimens (5,18,33–35). Most of these, but not all, concomitantly used corticosteroids. Although corticosteroid monotherapy initially seemed promising (36), subsequent RCTs have failed to show a benefit (37,38). Less rigorously studied treatment protocols (mycophenolate mofetil, azathioprine) were seldom used in this cohort (39,40). Immunosuppressive therapies received over the time frame of our study appear to closely parallel the evolving evidence base in regards to data that identified factors relevant to high risk of progression and/or effective therapeutic regimens. Certainly the treated patients represented a high-risk population defined by severe proteinuria and progressive decline in CrCl before the initiation of immunosuppressive therapy. The regimen with the best long-term data—cycling an alkylating agent with a corticosteroid—has never been applied to this high risk of progression MGN population in an RCT. This was not a RCT, and the dosages of immunosuppressive drugs differed significantly, perhaps in relation to the perceived risk-to-benefit ratio, the actually observed adverse effects, or the earlier-than-expected benefit of the treatment. The propensity score approach (41) has become an increasingly common method in other disciplines of medicine used in cohort studies to test if a specific treatment or risk factor independently influences outcome. It allows simultaneous adjustments for multiple confounders (42–44). Traditionally, matching in observational cohort studies has been done manually. Each additional variable to match would reduce the study population. A tradeoff existed between obtaining extremely similar groups and keeping the largest number of patients (and statistical power) needed to test a hypothesis. The propensity score method combines all measured confounders of interest in a single score used for matching. Examining the differences in distributions of confounders between matched groups is performed to verify the appropriate balance (23). Although neither this nor any other method can account for unmeasured variables, it is the best currently available for this type of analysis. On the basis of the number of patients receiving immunosuppressive therapy, only five variables could be included using this method. Of the known demographic and laboratory risk factors affecting renal progression and renal survival, we chose the most important ones—age, initial CrCl, peak proteinuria, MAP during follow-up, and the use of ACEIs or ARBs (21). Although the number of treated patients was modest, many patients of this study predated “effective” treatment regimens, physicians often considered steroid monotherapy as an appropriate treatment up until 1990, and few patients were high risk. In conclusion, we applied this propensity scoring method to our MGN population and showed that this is an important new approach for analyzing observational data. It allows us to compensate for variations in the disease and its treatment over time. Our results illustrate the need to recognize the relevance of changes in not only presenting characteristics of MGN but also new management strategies (e.g., RAS blockade) and new treatment targets such as lower BP. Furthermore, this study supports the role of our current immunosuppression regimens in MGN by indicating not only improved short-term outcomes but also the hard outcome of renal survival. This methodology does not replace the need to complete a proper long-term RCT, but it does give credence to our current approach to the management of high risk of progression MGN patients. It also emphasizes the value of maintaining prospective, long-term registries in these rare diseases to recognize, assess, and adjust for potential confounders. H.N.R. is the recipient of a KRESCENT clinician scientist fellowship from the Kidney Foundation of Canada and the Canadian Institutes of Health Research (CIHR). S.T. 's research efforts are supported by the Fonds de la Recherche en Santé du Québec. This study was supported in part by a grant from the CIHR Net Grant on Genes, Gender, and Glomerulonephritis (no. 452773L). We thank the glomerulonephritis registrars N. Ryan and P. Ling for help in the collection and management of data and the following nephrologists for contributing patients and support to the registry: Drs. S. Albert, J. Bargman, M. Berall, P. Bohl, H. Bornstein, G. Buldo, C.J. Cardella, C. Chan, P. Chan, D.Z. Cherney, S. Chow, E.H. Cole, S. Donnelly, I.O. Elkan, S.S.A. Fenton, M.B. Goldstein, R. Golush, G. Hercz, M. Hladunewich, M.R. Hockley, V. Jassal, K. Kamel, A. Kang, S.Y. Karanicolas, J. Kim, D. Kim, L. Lam, A.G. Logan, C.E. Lok, M.E. Manuel, P. McFarlane, H. Mehta, D. Mendelssohn, D. Naimark, B. Nathoo, P.S.Y. Ng, M. Oliver, D.G. Oreopoulos, S. Pandeya, Y. Pei, Y.A. Pierattos, V. Poulopoulos, R. Prasad, B. Reen, R.M. Richardson, J. Roscoe, D. Ryan, J. Sachdeva, C.S. Saiphoo, D. Sapir, J. Sasal, M. Schreiber, M. Silverman, A. Steele, E. Szaky, P. Tam, D. Tam, D.S. Thompson, R. Ting, S. Tobe, A. Wadgymar, L. Warner, C. Wei, C. Whiteside, G. Wong, G. Wu, and J. Zaltzman. We also thank participating pathologists T. Feltis, A.M. Herzenberg, S. Jothy, R. John, G. Lajoie, and L. Sugar. The authors had full access to all of the data in the study and take responsibility for the integrity of the data and the accuracy of the data analysis.